Next day delivery poyurethane factory lab chair on glides with padded polyurethane seat and back, and a static footring, providing ideal seating for school laboratories, science classrooms, workshops, factories, and all other industrial applications. 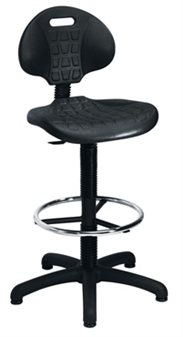 The chair features a fully adjustable gas-lift mechanism, and adjustable back-height. The chair is wipeable for easy cleaning.